Our Lanzarote surf courses and clinics are ideal for any level of surfer who wants intensive coaching at the highest level available in Europe. We also offer the widest choice of handpicked private accommodation in Famara within easy walking distance of the beach and reef breaks. The surf school is a ISA accredited and only employs ISA qualified instructors with Surf Life Saving Awards. All the surf instructors employed by the Lanzarote Surf School are skilled watermen who have many years experience surfing and coaching at different levels. They have travelled extensively in search of that perfect wave, have sampled many different cultures and have learned to respect the ocean and environment we live in, for those reasons alone they are perfect role models. All the surf instructors have trained and qualified as lifeguards via the Spanish Surfing Association or equivalent. They have all the necessary skills and experience to help participants progress to a level where they can become independant surfers. All instructors are multi-lingual and speak a good level of English. The Surf Lessons have a low student to instructor ratio for safety reasons and to ensure you get the attention you need on dry land and in the water. All participants are placed with an instructor who specialize in teaching at a particular level. All the equipment used by the Surf School in Lanzarote is specifically designed for beginners and intermediates with safety being the key factor. Beginners will use NSP boards specifically designed for both stability and safety. Intermediates will use boards which provide a good blend of stability, manouverability and performance. Custom boards are available for more experienced surfers who are already comfortable riding a higher performance board. The instructors will select a board suitable for your size, weight and ability. All the equipment is checked and maintained on a regular basis to ensure you have the best material at your disposal. The school also provide a wide range of good quality wetsuits and rash vests. 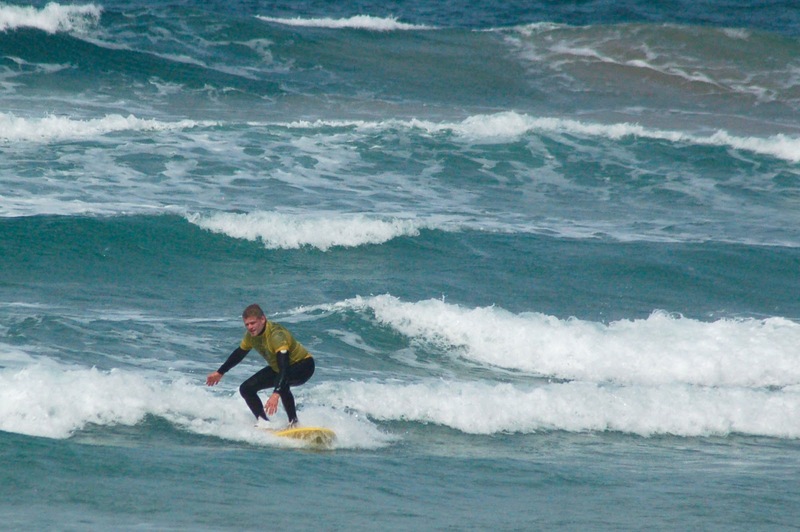 The main aim of the 5 day Beginners Surf Course is get participants up and riding waves in a safe and fun environment. The surf course aimed at this level covers the Surf Essentials outlined below. At the end of the course each partipipant should have experienced the rush of riding a green/broken wave safely to the shore. • Catching green waves and angled take-offs. 9:45 Meet at the Surf School Center. 10:00 Hop in the mini-bus and off to the beach. 10:00-10:30 Surfing theory and pratice on dry land..
10:30-11:00 Warm-up, stretching and simple exercises on the beach. 11:00-13:00 In the water! Surfing under the personal supervision of the surf instructors. 13:00-13:30 Picnic lunch on the beach, recovering from the morning surf session, recharging the batteries and soaking up some of the Lanzarote sun. 13:30-15:00 Back in the the water for session number two! Surfing under the personal supervision of the instructors, correcting any bad habits that you might have picked up or perfecting your technique. 15:30 Back to the Surf House to chill out and ponder the days achievements. The main aim of a the 5 day Intermediates Surf Course is to help you to correct any “bad habits” developed over time, perfect your style and learn new surfing techniques/manouveres. Our instructors can help you learn how to duck-dive correctly so you can easily get outback, you can then learn about your position in the line-up, timing/wave selection and take-off. You can then work on improving your bottom turns and learn how to cut-back and use the pocket/power of the wave to increase you rides. Progression = More waves = Progression! For those of you who want to take your surfing to the next level you can learn how to pull off some of the more radical manouveres such as “floaters”, “re-entries”, and prepare yourself for what most surfers consider the ultimate surfing experience how to stall and prepare yourself to get barrelled! 10:00-10:30 Identify areas that need working on/improvement. Recap on theory and beach safety. 11:00-13:00 In the water! Surfing under the guidance of the surf instructors with useful hints and tips. 13:30-15:00 Back in the water to perfect what you have been working on in the morning session or move onto more advanced surfing techniques. 15:30 Back to the Surf House to chill, have a few beers and share tall surf tales with the other guests.